If you have visited the Sistine Chapel in the Vatican City, you have definitely been stricken by the amazing painting that decorates its ceiling. The Creation of Adam, completed by Michelangelo around 1511 in only two to three weeks, is a masterpiece known to the world. The painting is the fourth in the series of panels relating to the story of the Genesis, and depicts God the father “giving life” to Adam, the first man. Surrounded by angels and inspiring command and power, God stretches out his finger in an attempt to reach out for Adam who is beneath him. The most iconic detail of the painting is the image of the near-touching fingers, which has been reproduced in so many contexts and imitations. By painting a space between the fingers, Michelangelo builds an anticipation of the great moment of Creation. Although small, this detail is the focal point of the painting and has been the subject of many interpretations. To this day, Michelangelo di Lodovico Buonarroti Simoni (6 March 1475 – 18 February 1564), commonly known as Michelangelo, is considered one of the greatest artists who have ever lived. Working in painting, sculpture and architecture, he contributed remarkably in the development of Western Art, earning the title of the archetypal Renaissance man. A number of his masterpieces are estimated to be among the most famous in the world. 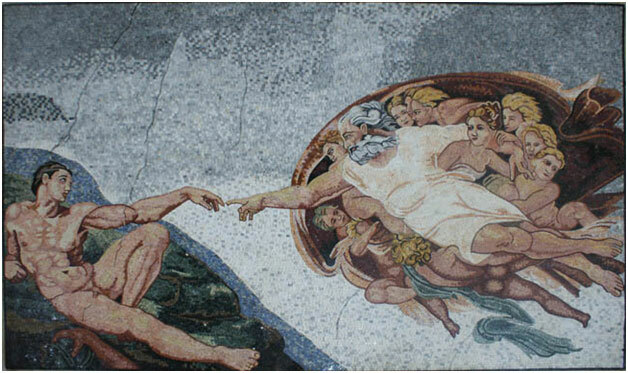 You can find “The Creation of Adam” in Mosaic Marble’s collection of famous artists’ mosaics. The beautiful reproduction is a faultless masterpiece that can gracefully and exceptionally adorn any living space.